Type 1 diabetes occurs when the immune system attacks and destroys the beta cells in the pancreas that produce the hormone insulin. Without insulin, the level of the sugar glucose in the blood cannot be controlled. Type 1 diabetes is a serious lifelong health condition. 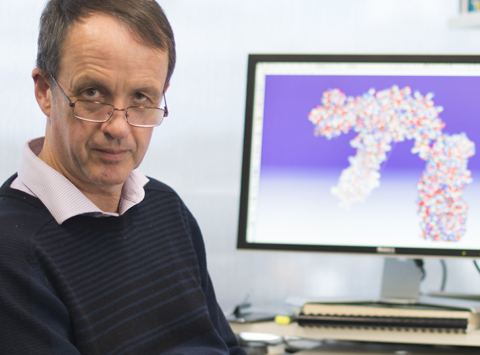 Our type 1 diabetes researchers are discovering how harmful immune responses damage the insulin-producing cells. This is leading to new ways to prevent and treat type 1 diabetes. Understand why immune cells attack insulin-producing cells. Develop and trial new ways to prevent type 1 diabetes. Develop strategies to regenerate insulin-producing cells from stem cells as a cure for type 1 diabetes. Improve the success of pancreas transplantation as a cure for type 1 diabetes. The amount of glucose in the blood is normally tightly controlled. But in diabetes blood glucose levels are abnormally high. The hormone insulin normally reduces blood glucose levels and is produced by cells in the pancreas called ‘beta cells’. However in type 1 diabetes there is a misdirected ‘autoimmune’ reaction to the insulin-producing beta cells in the pancreas, which leads to insufficient insulin being produced. Without insulin, high levels of glucose accumulate in the blood. The immune system protects our body from invading microbes. There are normally many safeguards that prevent it from attacking the body’s own tissues. In type 1 diabetes, these safeguards fail, and immune cells specifically destroy beta cells. Type 1 diabetes is the most common chronic (long-term) childhood illness in Australia. More than 120,000 Australians have type 1 diabetes. The incidence of type 1 diabetes in Australia has increased in the past 30 years. Type 1 diabetes is caused by a combination of genetic risk and environmental factors. Our researchers have shown that changes in our environment have contributed to the increase in the incidence of type 1 diabetes in the past few decades. Many environmental factors have been proposed to trigger or promote type 1 diabetes. These include infections, diet and weight gain. Having other autoimmune or inflammatory diseases such as coeliac disease or autoimmune thyroid disease. These conditions all involve aberrant immune responses. Having a parent or sibling with type 1 diabetes or other autoimmune diseases. One in five Australians diagnosed with type 1 diabetes have a family history of the disease. Living at higher latitudes: the incidence of type 1 diabetes is increased in populations who live furthest from the equator. This may be partly genetic. It may also be related to environmental factors such as vitamin D deficiency and hygiene. Almost all people with type 1 diabetes rely on insulin injections for their entire lives. They must closely monitor their blood glucose levels. When blood glucose rises, such as after a meal, an appropriate insulin dose is calculated and injected. Insulin is available in ‘slow acting’ and ‘fast acting’ forms. These can aid the smoother control of blood glucose levels. There is no orally available (tablet) form of insulin. Insulin can only be given by injection, such as with a syringe. Recently, small, attachable insulin pumps have been introduced instead of multiple daily injections. Insulin pumps may control blood glucose better by providing a more steady release of insulin into the body. The only cure for type 1 diabetes is transplantation or regeneration of insulin-producing cells. Transplantation of the whole pancreas or the parts of the pancreas containing insulin-secreting beta cells can be performed. It is limited by a shortage of organ donors, and the need for life-long immune suppression to prevent transplant rejection. Thus, transplantation is restricted to people with poorly controlled diabetes and serious complications. Our researchers have shown that the pancreas contains stem cells that can be transformed into beta cells. Their hope is that it may one day be possible to cure type 1 diabetes by stimulating the regrowth of beta cells. This would depend on stifling the immune cells that originally destroyed the beta cells. Diabetes Australia has more detailed information about diabetes treatment. Our research into how immune cells attack insulin-producing cells has led to a new strategy to prevent type 1 diabetes. A nasal insulin ‘vaccine’ developed by our researchers has shown promise in clinical trials for preventing the development of type 1 diabetes. A drop in the number of young children diagnosed with type 1 diabetes could be associated with the introduction of routine rotavirus vaccination of Australian infants. Australia's largest study into the causes of type 1 diabetes will track women and children from early pregnancy to three years of age. The JDRF Lifetime Research Achievement Award recognises the long-standing nature and high quality of contributions of the very best Australian researchers who have steered global directions of type 1 diabetes research.